The above two sources both carry good quality satin rattail 1 mm cord. Other places have 1mm cord, but not necessarily the best quality. The prices are similar from both places, but Primitive Originals has cord by the yard, so you have more flexibility ordering the lengths you want. Note: Primitive Originals has 1mm cord by the roll, and while it is much cheaper, it is a different product. It is smaller (thinner) and stiffer and not as smooth as the cord sold by the yard. Use 6/0 for 1mm rattail and 8/0 for S-lon and C-lon cords. Both are found many places. The larger number means a smaller bead. 5/0 is larger than 6/0, and 11/0 is smaller than 8/0. 6-ply floss can be used in place of 1mm rattail. When used double it is just a bit small than 1mm rattail; when used triple it is larger than 1mm rattail. The chart shows color numbers, and color names, and color samples, but don't rely on what you see on your screen to be the true colors. There are many hundred colors of floss (unlike only 30+ satin rattail colors), and when using different colors of the two strands of floss in place of one 1mm satin rattail, mixing the colors gives you even more color variations. DMC Satin Floss has the same numbers as the corresponding non-satin floss; i.e. DMC #211 is lavender, DMC #S211 is satin lavender. 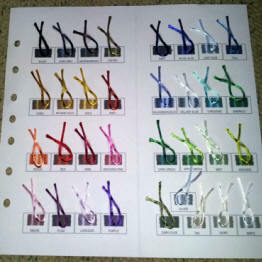 There aren't as many DMC Satin Floss colors as the non-satins, around 100. DMC Satin Floss is a bit more difficult to work with as it is slippery and doesn't stay in a knot. Primitive Originals is a very good source for kumihimo clasps right now because they have reasonble lobster endcaps with a chain, and since I'm having braid length commitment issues lately, the chain gives flexibility of length. Also, another chain "extension cord" can be added for more lengh. Using a chain also spreads the weight of the clasp out and helps prevent the clasp from spinning around to the front, another constant challenge and a particular annoyance for me. An 8-strand braid of 1mm satin rattail cord can be used with a 5mm or 6mm endcap or clasp. A 12-strand braid using 1mm rattail can be squeezed into a 6mm, and a 16-strand uses an 8mm. I keep track of my pieces by recording each one on a half sheet page. It's very handy to be able to look back and see how I made a certain piece. Each page includes details about the piece, length of threads, position of threads on the disk, a photo of the piece and sample threads, and more. There are numerous tutorials on www.youtube.com. Just do a search on "kumihimo." The instructions with the kits are also excellent.